Our Penn State Health Children’s Hospital Vertical Expansion team was looking for a better way to inform and review design decisions with our clients instead of just relying strictly on static renderings to illustrate design concepts. Instead, the design team utilized the Enscape Plug-in tool which can create a good quality walk-through of a Revit model and allows our team to to review and make design decisions collectively. When the Penn State Health Children’s Hospital Vertical Expansion team initially investigated Enscape, we weren’t sure whether it could be used for user meetings or not. Enscape is a real-time rendering plug-in which allows one to walk-through 3D models in Revit, Rhino and Sketchup. It was a new exploration for the team, and for me as it was my first experience creating a Revit rendering. After two weeks of trial, we produced a Revit walk-through for an interior user meeting which featured important spaces in the project, such as a double-height lobby and a patient corridor with selected finishes. The first interior user meeting was very successful, so the team decided to prepare finishes for all 3.5 floors. The most powerful advantage of using Enscape in Revit compared to other rendering methods is that it promptly updates every team member’s work. Our team already had a developed Revit model, so we needed to decide color options and quickly implement them in different spaces. By using Enscape, we also can examine our designs in three-dimensional spaces and “walk through” all occupiable spaces by using our VR googles, which means every surface has to be well-defined. A waterfall wall study was initiated after we started using Enscape as the ceiling of the area had to be geometrically determined. The waterfall wall is one of the signature spaces which features a five-floor height vertical glass wall with three different colored glasses. In the existing wall, the horizontal mullions were stepped in the middle to provide seating around the window as shown in my hand sketch below. 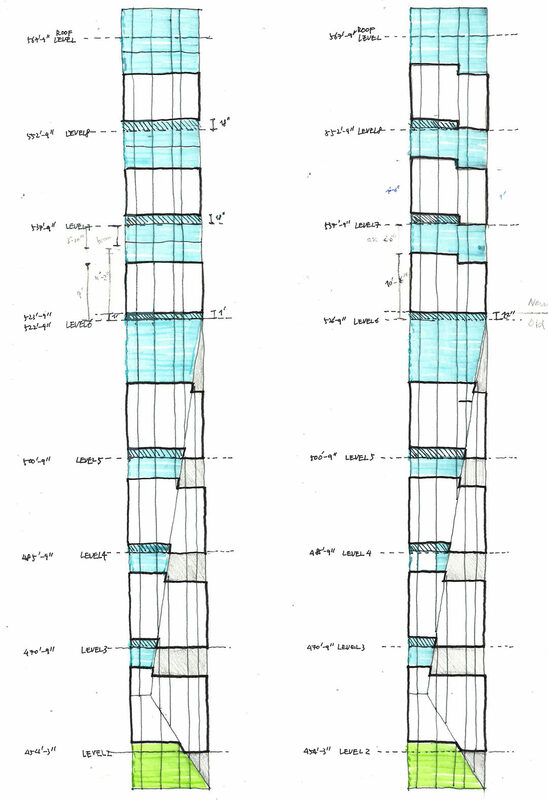 Another three floor height vertical glass wall would be installed, and we initially decided to make curtainwall mullions to be straight across. However, after exploring the space three dimensionally, we felt it would be beneficial to have stepped mullions to provide seating and keep the split ceiling condition with different slopes. There were several design iterations in terms of geometry, patterns and coloring, and it was really efficient to share screen shots through emails and get feedback from everyone in the team. Enscape provides our design team with more options such as video and panoramic view in addition to walk-through and VR. The tool has proved to be very useful our design process, not only as a representation tool for our user and client meetings, but also as a collaborative design tool for our entire project team to find the best design solutions for our project.